Lentils as well as any legume are an inexpensive source of protein, as well as fat-free, high in fiber and rich in a number of essential nutrients. 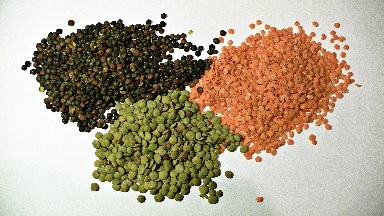 Adding lentils to your diet offers a number of health benefits, from controlling your weight to promoting heart health. You need 25 to 30 grams of fiber everyday, and one half cup of lentils will supply 8 grams of that fiber. Fiber in foods helps suppress appetite, helping you to manage and maintain a healthy weight. Eating a diet that is rich in dietary fiber also decreases LDL (bad) cholesterol levels in your body. If you have diabetes or are at risk of developing diabetes, fiber rich foods can also help in the regulation of sugar in the blood stream. According to the World Health Organization iron deficiency is the most common nutritional disorder in the world, and 1/2 cup of lentils provides 3.3 milligrams in a 1/2-cup serving. Keep in mind though, that your body can’t absorb as much iron from plant-based foods, including lentils as it does from meat sources. Eating lentils with a food rich in vitamin-C, such as sweet peppers, can help improve absorption. As you might have guessed by now our featured recipe has lentils, and to help your body take advantage of the iron in them, the recipe includes vitamin-C sources, including green beans, carrots, and celery. 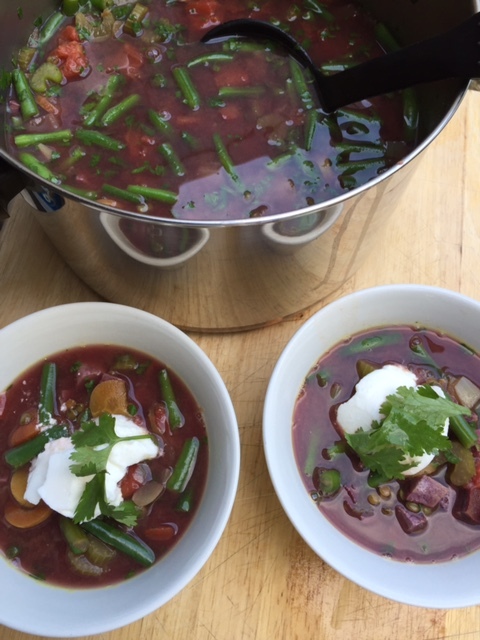 Our featured recipe is: Lentils and Purple Sweet Potato Stew, and here is what you will need. Prepare vegetables and in a extra- large saucepan, heat oil over medium-high. Add the onion, carrots, celery, and bay leaf. 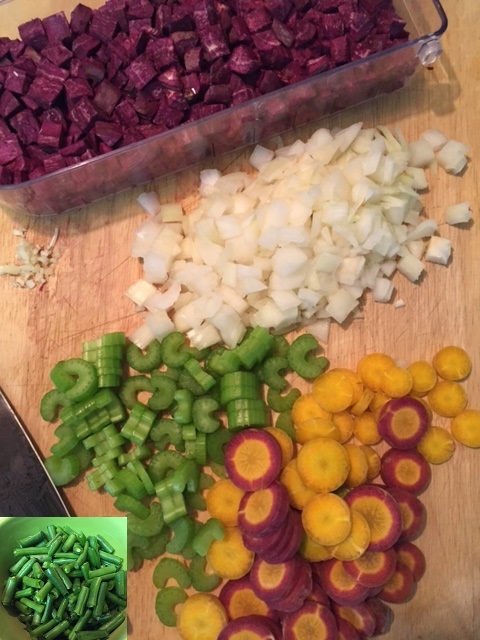 Cook the vegetables while stirring until they are softened, about 5 to 7 minutes. Next add the garlic and curry powder and cook until fragrant, about 1 minute. Next add 7 cups of fresh water and the green lentils. Turn heat to high and bring to a boil, reduce heat to a simmer, cover the pot, and cook 10 minutes. Next add the sweet potatoes and continue to cook, with the pot covered, until the lentils and sweet potatoes are just tender, about 15 minutes. Nest add the green beans and can of diced tomatoes with juice, and cook until warmed through, 2 to 4 minutes. Remove bay leaf from stew pot, and add the chopped cilantro and stir until combined. Season with salt and pepper. Serve with a dollop of yogurt and whole cilantro leaves. Enjoy!! 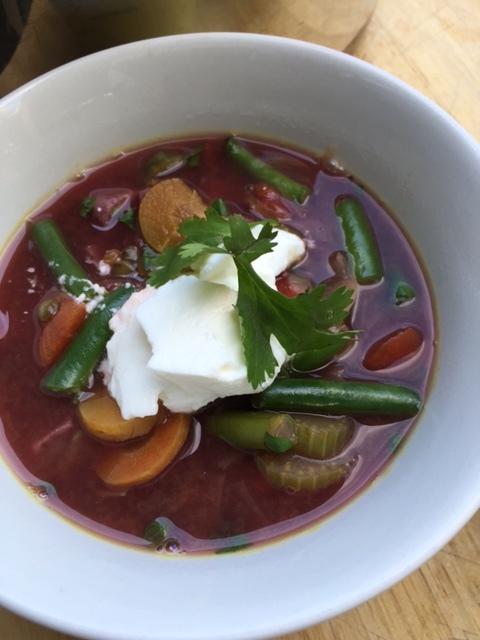 This entry was posted in Soups and Salads and tagged Avocado, Bay leaf, Dietary fiber, Eating, Fat, Greek yogurt, Health, Himalayan salt, Hot chocolate, ldl cholesterol, lentils, Olive oil, purple sweet potatoes, rainbow carrots, Salad, Saturated fat, Stew, Strained yogurt. Bookmark the permalink.